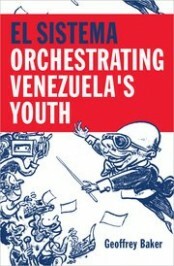 The Venezuelan youth orchestra scheme El Sistema is perhaps the world’s most famous music education program today. It’s lauded as a revolutionary social program that has rescued hundreds of thousands of Venezuela’s poorest children. Simon Rattle has called it “the most important thing happening in music anywhere in the world.” Classical music education is back in vogue, now aligned with the rhetoric of social justice. However, the training of social or ethnic Others (the poor, the destitute, the non-white) as classical music performers is hardly a new idea, and delving into its long history may improve understandings of El Sistema outside Venezuela, which are currently very limited. While this training might have provided a helping hand to the most disadvantaged in society, it also had less benevolent aspects. The music conservatoire has its roots in the conservatorios, or orphanages, of Renaissance Venice. Young female orphans were trained in music at institutions such as the Ospedale della Pietà, where Vivaldi worked. These institutions served a clear charitable purpose, providing for destitute children and aiming to turn them into productive citizens. Yet it’s worth noting a couple of further points: discipline and profit. The Ospedali Grandi’s purpose was primarily to regulate the city’s social environment, and along with the opportunities provided to impoverished girls went strict control over their day-to-day lives. As Vanessa M. Tonelli notes, the young musicians had to submit to an inflexible monastic routine: silence, lots of work, and little leisure time. When the English music historian Charles Burney visited in the eighteenth century, he noted “good discipline observed in every particular,” and he described the orchestra as “under the most exact discipline,” with its musicians “under that kind of subordination which is requisite in a servant to a superior.” Clearly, then, musical training was an extension of the Ospedali’s social control. It also had an economic angle: concerts by the orphan girls became a major attraction, and the Ospedali were thus able to turn their musical talents into profit, enriching the institutions and their administrators by eliciting larger donations. Naples, too, had a conservatorio system, in which, as David Yearsley writes, music “was drummed into thousands of children in a system of forced labor…. There was huge international demand for the fashionable Neapolitan style, and the conservatories fed it.” Employing a training system that was “often cruel,” these “music mills” forged highly trained performers for export across Europe. Their art “belied the inexorable regime of study, discipline, and punishment that lay behind it”: Burney described sweatshop-like conditions, with students practising ten hours a day with only a few days off per year. 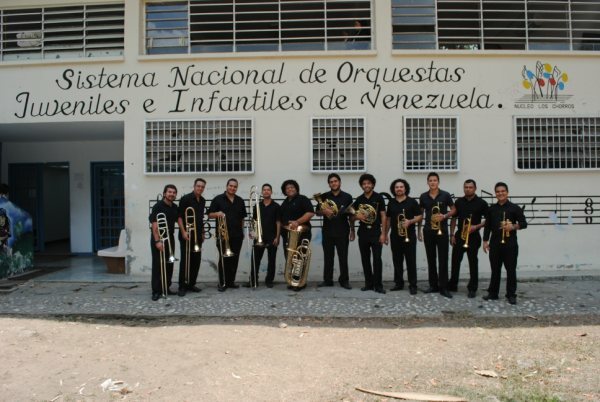 Caracas Brass, El Sistema. By Agonzalez. CC-BY-SA-4.0 via Wikimedia Commons. Yearsley posits a “dialectic of musical enlightenment: on one side of the split screen was the musical workhouse of the poor orphans, on the other, the courtly chamber filled by the most elegant music played by bewigged and fully-trained instrumentalists.” Enchanting music emerged from conditions of control and exploitation. The alliance of coercion and beauty was not limited to Europe. The Spanish Conquest of the Americas saw missionaries fanning out across the continent and founding schools that taught music as a core subject. A key aim was to instill in the indigenous population what the Spaniards called policía–order, Christianity, and civilization. Music education thus served as a handmaiden of colonialism. In nineteenth-century Britain, music education was promoted among the poor as part of a drive for moral and religious improvement. Howard Smither argues that a key motivation was the political protection of the upper and wealthy middle classes. Music was seen as a way of keeping the workers out of taverns, increasing their productivity and decreasing their opportunities to discuss revolutionary ideas. Similarly, David Gramit underlines how nineteenth-century educational reform in Germany reaffirmed the social and economic order; music education proponents “sought to create a disciplined but docile labor pool” and thus promote more efficient capitalism. Grant Olwage explores how the perceived efficacy of music education as social control in Britain made it an obvious tool for disciplining and “civilizing” the black population in its colony in South Africa. What all these programs had in common was an attempt to order and control social Others. They reveal music education in its guise of disciplinary practice, and thus as profoundly ambiguous. As Michel Foucault argues, discipline is effective and productive, as the high level of performing skill attained by many of these musical trainees attests. But discipline also “imposes unequal, asymmetrical, non-reciprocal relations” (James Johnson), and produces docile, apolitical subjects. Music education thus brings benefits, but they often accrue as much to the educators as the educated (as economic and symbolic capital) and may be accompanied by significant (if hidden) costs. Training, discipline, profit: these three threads run through the history of music education of social or ethnic Others. Let’s now turn to Venezuela. El Sistema has been lionised by the international press as a revolution in artistic education and a beacon of social justice. Clearly, then, there has been a failure to connect it to similar music education initiatives stretching back half a millennium and to take account of the darker side of music education. For all the contemporary talk of a “revolutionary social project,” El Sistema offers little that is new—its core ideas were presaged in sixteenth-century Latin America and nineteenth-century Europe–and such programs have historically been reactionary, not revolutionary. Historical precedents alert us to the possibility that alongside El Sistema’s undoubted productivity lie discipline and profit. And indeed, the Venezuelan program displays a familiar urge to control social Others and benefit from their musical activities. Founder José Antonio Abreu has said: “As an educator, I was thinking more about discipline than about music.” Gustavo Dudamel and the Simón Bolívar Youth Orchestra, meanwhile, have become mainstays of the global music industry, attracting the kind of international praise and wonder that Venetian orphan musicians did centuries earlier, and generating considerable revenue in the process. Like the Neapolitan conservatorios, it drills young performers intensively to fulfill the desires of audiences across Europe; once again, the musicians’ “naturalness” is celebrated, their unbending training regime overlooked. To understand El Sistema, we need to remember music education’s two faces. The press and public have fixated on one–“rescuing” and training the poor–and have largely ignored the other: discipline and profit. Only when the second is fully grasped can a proper assessment be made. Geoffrey Baker is a Reader in the Music Department at Royal Holloway, University of London. His books include Imposing Harmony: Music and Society in Colonial Cuzco (2008), which won the American Musicological Society's Robert Stevenson Award, and Buena Vista in the Club: Rap, Reggaetón, and Revolution in Havana (2011). He has also created a series of ethnographic films about childhood music learning in Cuba and Venezuela.